Mechanical tube mods are still quite popular, and provide a much different vape experience in comparison to regulated devices. The feeling alone of holding a tube mod in comparison to a box mod is just different as well, and will certainly bring some vapers back to a time when high powered regulated box mods didn't exist. VGOD has released their newest hybrid mechanical tube mod, providing an affordable device, but still offering solid performance. 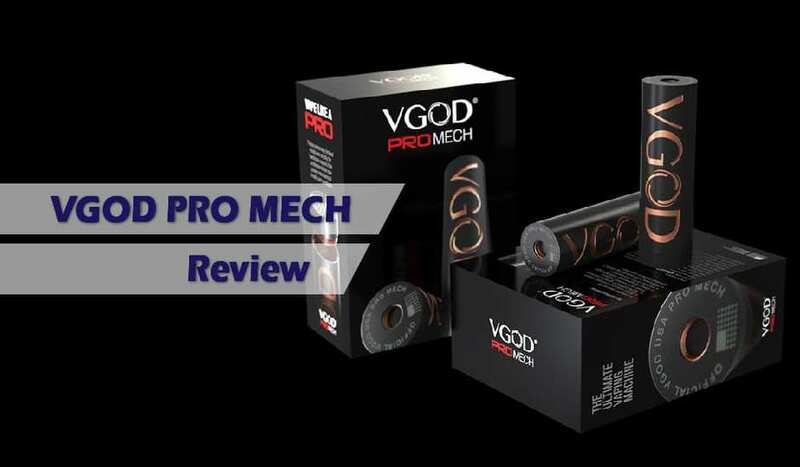 Firstly, I do want o thank Heaven Gifts for sending the VGOD Pro Mech Mod my way for the purposes of this review. I will go over my first impressions, using the device, its overall performance, cons, and conclude with whether or not I recommend it! When I first received this product, I noticed the packaging immediately. It does come in a relatively large box that goes over some details about the product itself. However, what came inside of the packaging is what really surprised me. Inside of this packaging, you do receive a case, which is where the VGOD Pro Mech Mod is located. The included case is a really nice bonus, because you can store anything in there really such as e-liquid, RDAs, RTAs, even a smaller box mod can fit with no issues. It does have straps inside, so whatever you do store will be secure. Also, there is a pocket with a net as well, where you can store batteries, cotton or any other accessories. The front of the case does say VGOD, which is another nice touch, and definitely appreciated. Honestly, the overall presentation of the VGOD Pro Mech Mod as superb. It may be something small to look at, but I always appreciate a product that has a great presentation, as it will only provide the user with a great first impression. 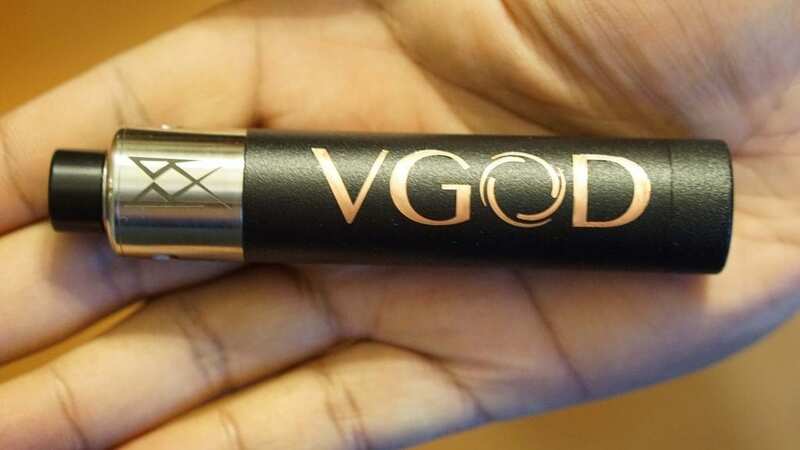 When first seeing the mechanical tube mod, I noticed the deep VGOD engraving. This device is constructed of billet copper, which is what you see within the engravings. However, this tube mod has a matte black coating, so you won't get any copper smell on your hands, which is a huge pro for me! The VGOD Pro Mech Mod is a bit shorter that some of my other mechanical tube mods, which was nice and makes it comfortable to hold. Honestly, its size is near perfect for me. Also, I did notice the solid quality of it as well. All of the threading was smooth, and it came very clean. I didn't notice any machine oil anywhere, and the feel of the matte coating is also very nice. However, this is subjective, and some may prefer the feel of copper over a matte black coating. It does have a texture to it, but it is comfortable to me. Something else I noticed right away was the carbon fiber on the button. It does have a nice texture to it, and does feel like actual carbon fiber. Some vapers may not like the feel of it, but I actually liked it. Also, the button is recessed, so you can sit it on a table without worrying about it auto-firing. In addition, this tube mod does have vent holes throughout the body of the mod. This is definitely a huge pro, as it adds a ton of safety for the user. Typically, tube mods have vent holes towards the bottom, in the button itself, or just towards the top, so seeing multiple vent holes is just a huge plus. The overall diameter of the VGOD Pro Mech Mod is 24mm, so all of your 24mm atomizers will sit flush. However, your 22mm atomizers won't look as good, so some vapers may see this as a con. However, many atomizers that are being released are typically 24mm, so it's not a huge con by any means. Included with the VGOD Pro Mech Mod, you do receive an additional gold plated spring. This is definitely a pro! Some vapers may prefer a button with magnets, but I personally do not mind a spring. I do want to mention that this tube mod does have a hybrid connection, which means the 510 of your atomizer and the positive side of your battery will come into direct contact; therefore you must use atomizers with protruding 510 pins only! If you do not, then you will hard short your battery, which is something you want to avoid at all costs. So, please if you are using any hybrid mechanical mods or interested in one, be aware of this. Also, since there are no safety features, it is recommended that you understand ohms law and battery safety before using a device like this. Do not use any batteries with torn wraps either, as this can cause issues as well. In addition, always stay within your battery limits. All in all, my first impressions of the VGOD Pro Mech Mod were all good! The overall quality of this tube mod was great, especially considering its price, and the inclusion of the case was certainly a pro in my opinion. In the next section, I will go over my experiences using the device! Like stated previously, the VGOD Pro Mech Mod is a bit shorter than some of the other mechanical tube mods I currently own, especially 24mm tube mods. This made it comfortable to use and hold over time, and it just felt right every time I grabbed it and took a vape. Also, the matte black coating was very comfortable and it gave the mod a nice feel. Like said before, some vapers may not like it and will prefer no type of coating, but for me since it covered the copper it was a huge pro. I personally dislike the smell of copper on my hand, so I welcomed the matte coating. In addition, over time I didn't notice any chipping or peeling, so the coating has held up fine with use. Of course this can change in the future, and I will update if I notice the coating wearing off. You can definitely feel the quality of this mod when you holid it as well. The quality is definitely well above average, especially considering its price. The button has a nice throw as well, and not too stiff either. You can't really fire it with your pinky finger, but with your other fingers it doesn't take much effort to fire it. Also, the throw is very smooth. The carbon fiber button is definitely a nice touch, and gives it its own unique touch. I can definitely see some people not liking the texture, but I personally liked it. This also doesn't show any wear either, which is great. The VGOD Pro Mech Mod does feature a self-adjusting gold plated battery contact, so you never have to adjust for battery rattle. In addition, I never experienced any battery rattle with any of the atomizers I attached to this device, which is a huge pro. I do want to mention, I didn't really notice any patina in the VGOD engraving. I do think after some time the patina will start to show, but it hasn't really started to patina yet, which is a good thing. Overall, using the VGOD Pro Mech Mod has been a pleasure. It is comfortable to hold, and best of all there's no copper smell on your hands! In addition, the button texture adds a nice touch, and the self-adjusting gold plated battery contact is definitely a huge pro, as it makes battery rattle non-existent without you having to do any adjusting! In the next section, I will go over the performance! The most important question with any mechanical tube mod is how does it perform? Well, I can easily say that the VGOD Pro Mech Mod performs extremely well! Honestly, this tube mod hits just as hard as mods that cost $100 more. My preferred builds for mechanical tube mods is either a dual fused Clapton with a resistance of 0.16 ohm or a simple 22GA Kanthal dual coil build with a resistance of 0.15 ohm. With either of these 2 builds, I get a nice satisfying vape experience with any atomizer I attach to this mod. Since the VGOD Pro Mech Mod is constructed of Billet copper, you can expect its performance to be good. Also, I do want to mention that I did not experience any misfires, and every time I hit the fire button, it fired with no issues. It is important to note that with mechanical mods, its performance will be determined by the build you put in your atomizer. Also, lower resistance builds generally perform better with these types of devices, since the wattage output is determined by the resistance of your coil build. Also, with a hybrid connection, you can expect minimal voltage drop as well. As stated previously with any hybrid connection, only use atomizers with protruding 510 pins! I cannot stress the importance of this. Even though it does have a spring rather than magnets, the throw still silky smooth, and I never had any issues in regards to the performance of the button. Also, I didn't notice any severe voltage drop, and like said before it was definitely on par with some of my other more expensive tube mods. All in all, the VGOD Pro Mech Mod was an excellent performer! Even though it performs well, there are still some cons to be mentioned, which is the next section. All of the cons listed here are subjective, as I did not find any major cons to be mentioned. The first cont to be mentioned is that this device utilizes a hybrid connection. Some vapers prefer to have a floating 510 pin rather than a hybrid top cap, so it's worth mentioning. Another subjective con is the texture of the button. Even though I found it comfortable, I do think some vapers may not like the texture. It is carbon fiber, which gives it a unique look, but it does carry that texture with it. Not a huge con if it is to be considered one, but still worth mentioning. Also, a subjective con is that this device is 24mm in diameter, which means that you're 22mm atomizers won't look the greatest. Also, 25mm atomizers won't sit flush and will overhang. In addition, a subjective con is the texture of the matte black coating. It does have a texture to it, which I find comfortable, but some vapers may not like the feel of it. 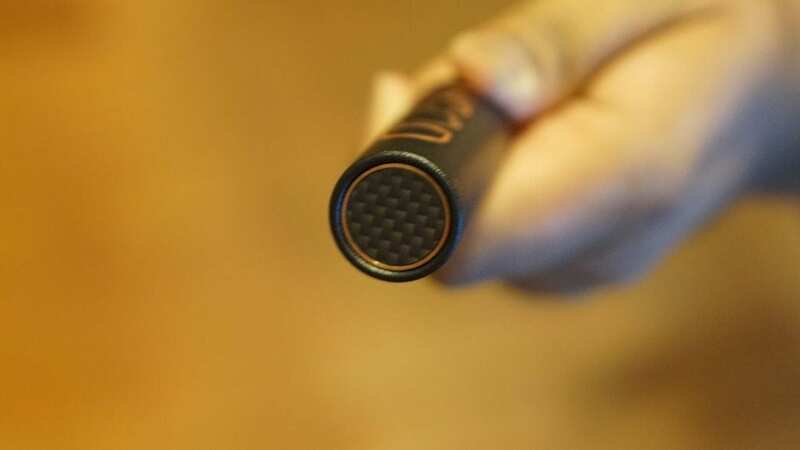 Also, some vapers prefer the natural feel of raw copper, so vapers who tend to like those mods will probably not be a fan of the matte black coating. The last subjective con is that the button utilizes a spring rather than magnets. I know some vapers who just simply prefer a button with magnets, so this is definitely worth mentioning. Overall, there aren't too many cons to this tube mod, if any really, which leads to the next section, the conclusion! In conclusion, the VGOD Pro Mech Mod is a solid performing hybrid mechanical tube mod. With the inclusion of the VGOD case, and extra spring, it makes it that much better. With its billet copper construction and the hybrid connection, it was only bound to vape well. The VGOD engraving is stunning, and the self-adjusting gold plated battery contact makes it so that you don't ever have to adjust for battery rattle yourself. Not to mention, I never experienced any battery rattle whatsoever with this mod. Also, with its compact form factor, and design cues, it makes it comfortable to hold and use all day long. The button throw, for me, is perfect and it's silky smooth. In addition, I never experienced any misfires, which is definitely a huge pro. Most of the cons to this tube mod are subjective, and I honestly couldn't find any real cons to it. For the price, and what you receive, it's just a great value overall. All in all, the VGOD Pro Mech Mod is a great mechanical tube mod. It offers a ton of value for a price much less than its competition. I can easily recommend this tube mod for the experienced user who's looking for a new hybrid mechanical tube mod! However, I do not recommend this device to beginners since it does utilize a hybrid connection. I hope this review helps you in picking the right device that fits your vaping needs! Feel free to leave any questions or comments below! Thanks for reading! What is the near wattage it can produce? Thanks! Glad you enjoyed the review! did it come with a tank/rda? It doesn’t come with an atomizer.